Junior defenseman John Schofield (9) stops on a dime and delivers a breakout pass. Senior forward Justin Fuglestad (19) moves the puck through the neutral zone. Many wondered who Norwood High’s new rivals would be when the school entered the TVL from the Bay State Conference this past fall. In boys hockey, that question was answered on Saturday night in Hyde Park: definitely Medfield. With Medfield having knocked Norwood out of last season’s Division II state tournament, there was already some history between the two teams. The Warriors (6-0-4, 2-0-3) entered the contest looking to stay unbeaten on the year and put a stranglehold on the TVL as the conference’s lone remaining unbeaten. Medfield took care of that aspect on Saturday night- they remained unbeaten - but probably not the way they wanted after surrendering a two-goal lead and settling for a 2-2 tie. Senior captain Shawn MacTavish fired home a goal on the power play at 8:20 of the first period to draw first blood for Medfield. Just 1:21 later, junior forward Mike Tyer nipped home a rocket upstairs on a two-on-one with Sam Palmer to double Medfield’s lead to 2-0. Chris Martin cut the deficit in half for the Mustangs (3-3-4, 1-2-3) by burying a rebound with 1:51 remaining to make it a 2-1 game at the first intermission. The second period provided both teams plenty of scoring opportunities, but despite each side getting multiple turns on the power play, the game headed to period three still 2-1 in favor of the Warriors. With a little over four minutes to play in regulation, Medfield was assessed a too many men on the ice penalty. Norwood capitalized with a goal from David Hayes to even the game at two with 3:07 remaining. The Warriors put their foot back on the gas and began pressuring the Norwood end in pursuit of the go-ahead goal, but to no avail. With time winding down, the Warriors made one last rush up the ice, but the puck was turned over and cleared as the clock expired. Senior captain/forward Shawn MacTavish (13) settles a puck down and gets set to turn-and-shoot. After the buzzer, the two teams exchanged pleasantries with some face washing and cross checks inside the Norwood end. There was no handshake line. Circle February 16 on your calendars - it’s the date when these two new rivals will meet for the second and final time this year (barring a state tournament rematch). 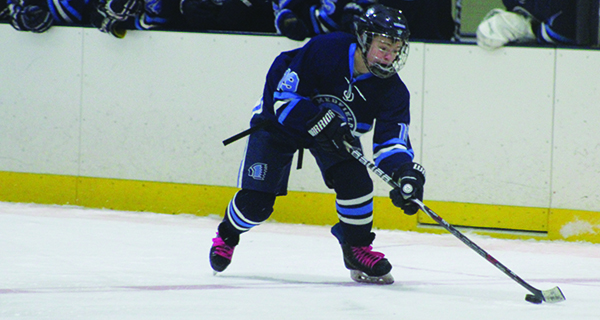 On Monday, Medfield earned a 6-2 victory over Bishop Feehan. The Warriors will return to the ice and look to keep up their unbeaten ways against Holliston on January 26.